A couple months ago, our nephew in Tulsa contacted us about some upcoming nuptials. You see, Lauren Beers and Madison Tittle are getting married this Memorial Day weekend. Lauren and Madison called to ask Mr. Beers and Mr. Bobo if we might consider officiating at their wedding. Consider it?! We were thrilled and honored to be asked. We got busy checking out things online regarding what we might have to do to be able to marry someone. And you know what? It's surprisingly easy. All you have to do is find one of these online "churches" or services and sign up. In fact, the one we signed up on, Universal Life Church, has been used by tons of people, including more than a few celebrities. It cost us nothing to be "ordained." But if you want all the paperwork and stickers and an ID card, etc., it's about forty dollars. 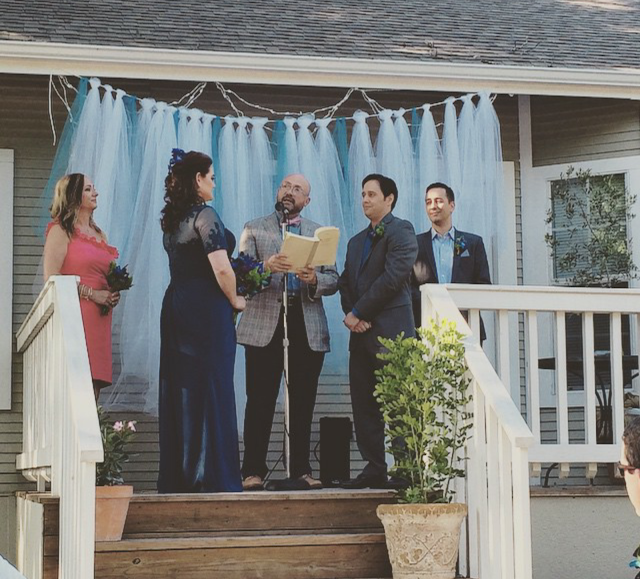 We were both more than a little surprised at how easy it was to become a minister in the Universal Life Church.